Whether or not Sridevi has ever tried to make a fashion statement, some of her looks became and have remained iconic through the years. Read: her white saree in Chandni. Well, seems like no matter how loved that look might be, Sridevi has ditched her whites for colours. Believe us when we say this time she picked no ordinary colour. 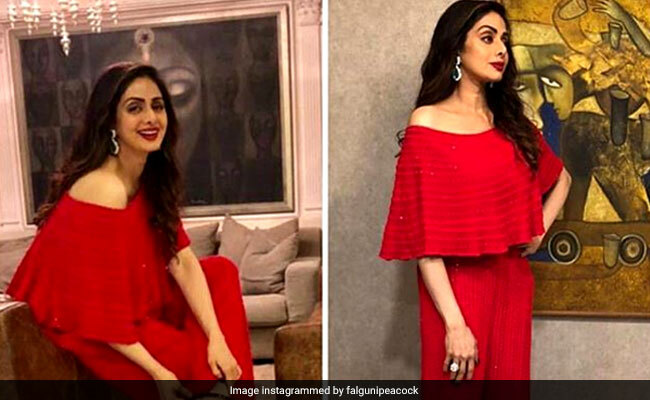 Last night, for Tina Ambani’s birthday bash, Sridevi wore a red hot jumpsuit from Falguni & Shane Peacock. Needless to say, she looked absolutely resplendent. Sridevi paired her off-shoulder red jumpsuit, which was embellished with tiny, shiny bead work, with simple black heels and jewelry from Mehernosh Heeramaneck. Her perfectly done hair and makeup matched her polished style perfectly. This isn’t the only time Sridevi has gotten it so right and made us want to steal her outfit. Attribute it to the right stylists, the fact that she has two rather fashionable daughters at home or just her great taste – either way, Sridevi seems to get it right more often than wrong in the style department. Designers Falguni & Shane Peacock also seem to deserve some credit for Sridevi’s immaculate fashion statements. Her red jumpsuit from last night isn’t the only glamorous piece she’s worn from their collection. For a party hosted to celebrate 25 years of a TV network recently, Sridevi wore a glittering silver jumpsuit from Falguni & Shane Peacock. She also attended Umang, the annual celebration in aid of Mumbai Police, in a beige and white Anarkali gown by the designers. Her recent appearances at the Lakme Fashion Week 2018 also had her bring her best fashion game. She stood out at the grand finale of the show in an Anamika Khanna creation along with her older daughter, Janhvi Kapoor. Sridevi isn’t just making heads turn in her appearances at formal or red carpet events. Even her off-duty style seems to be on point. While on holiday with her husband Boney Kapoor and younger daughter Khushi Kapoor in Moscow, Sridevi posted a picture of herself in a fur jacket, oversized round glasses and carrying a Birkin bag. Quite up to the minute, we’d say. Never was white as celebrated a colour until Sridevi wore it and danced in the rain. Sridevi captured millions of hearts through her dancing, acting and style in the 80s, but seems like she definitely has no intentions of stopping just yet. Though she’s making a statement in many different colours now, the white saree, although a much more expensive designer version, still seems to look as iconic on her. Sridevi is at par, if not ahead of, with all the contemporary fashion queens of Bollywood. We wonder if her daughter Janhvi, who is soon going to make her debut in a Dharma Productions film, will prove to be just as stylish.